What a well-prepared and articulate 16-year-old! The boy did not even flinch when he was attacked by one of American TV's most confrontational talkshow hosts. Classy and gutsy stuff. Ryan and I are taking a breather at a cafe along Rue Du Colisee, near Av Montaigne. Food here is very expensive and so far, only Mac's is the cheapest (about 6 Euro for a Big Mac meal). We are doing a lot of walking for our project recce purposes, but in this lovely 20 degrees weather, you can walk a lot and not feel tired or sweat. So far, we've seen the Arc de Triomphe and Eiffel and the shopping streets. I'm going to finish my 3.60€ coffee (tastes great) and carry on walking towards Musee d'Orsay. The daylight lasts till 9pm here so the day is still young. Met a nice lady from Taiwan at my event, her name is Patty. I have free wifi at my cafe, may as well upload some of my shots. Ryan and I are heading to Paris tonight for a week or so, on assignment. It's been a mad week prepping for it while juggling other work. 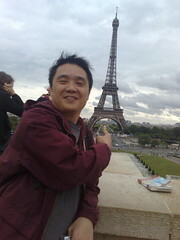 I'll be posting from Paris, and maybe even uploading a video clip or podcast or two from there. So stay tuned. 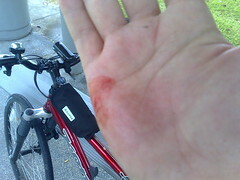 Ok. Had my first SPD-pedal-related fall just now. Unclip left foot, lost balance and fell to my right. At a traffic light. Sigh, very unglam. Ok, make that two falls, 20 minutes later. Not my Monday at all. Hahahaha! Just started using SPD pedals on my bike, partially on the advice of a nice cyclist I met on the way to work (he cycles from Yishun to Siglap to his bicycle shop). I had been thinking of getting the pedals changed anyway, because the old ones' teeth kept biting into my calves leaving a bloody mess. 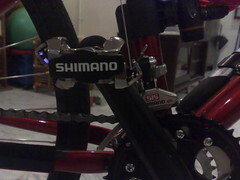 Mine are entry-level Shimano M520s. I also got a pair of charcoal M038 shoes to use them with. Cycling is certainly more efficient now because the leg doing the upstroke is lifting the pedal up while the other pushes down. But dang it, I end up using leg muscles that didn't need to do anything in the past. The other thing that takes getting used to is clipping out before I stop. You have to anticipate the stopping sometimes and get ready to clip out of the pedals, which is hard when you travel on a crazy road like Jalan Eunos with the mad traffic. Traffic lights are the least of your problems there. And walking with these shoes is also a weird experience. On pavements, you go clop-clop-clop because of that metal under your shoes. I feel like a horse. In memory of much-loved Singaporean musician, Wayne "Thunder" Seah, the rock concert Rock for Good 2007 has been renamed Rock For Wayne. It's a local rock concert now headed by co-director, Justin Roy. It is on tomorrow, 23rd June 2007, Saturday, at The Pavilion, Far East Square. Tickets are at $10 at the door. 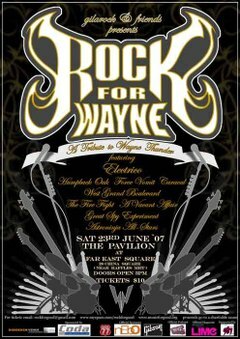 "Rock For Wayne is an all ages charity event with all proceeds going to Music For Good, a non-profit arts group. This year’s line up comprises of nine acts coming together to represent the dynamic force of local music. This includes surf veterans Force Vomit, new comers Caracal, and the now defunct down tempo Humpback Oak who are coming together for this one night only performance. This will also be poster child Electrico’s last performance before their announced hiatus." Famous New Zealand blogger, writer and radio personality Russell Brown was in town recently to attend CommunicAsia. We met up over some cold Hong Kong Perfect Match Tea/Coffee and chatted a few days ago, and had a good time catching up. He is now a fan of this Hong Kong tea house drink, I think. Russell will also be moderating at the international conference, Bananas NZ Going Global, organised by the New Zealand Chinese Association (Auckland Branch), to be held at The University of Auckland School of Business from 18th to 19th August 2007. By the way, I was invited by the kind folk from Bananas NZ to speak at this conference, on New Media, with other distinguished panelists. If you happen to be in Auckland at around that part of August, do go to the conference. It's nice to know they listen to the mrbrown show over in New Zealand. Speaking of New Media, in his CommunicAsia article, Russell also rants about telcos, about Singapore, and about a User-Generated Content forum made up of mostly folk from Mediacorp, world leader in User-Generated Content. You can read his rant over at Public Address, where he writes. Frankly a week at CommunicAsia has me not loving telcos. Hour after hour it was carriers blathering at each other, or being blathered at by consultants, about how content is king, and must be "compelling" and "exclusive" if consumers are to be wooed to new mobile and "quadruple play" IP services - without a single content person in the house. Not one. Apart from Spiteri, the BBC's excellent Dr Chrichton Limbert (I've written him up for a Listener column), a useful briefing on social media by Joe Colgan of Spectrum Strategies, a talk from the CEO of Korea's mobile TV provider TU Media and purely technical presentations like that on spectrum management by Kordia's Ian Goodwin, the fare at the four separate, confusingly overlapping conferences here has been generally disappointing. As a frustrated audience member pointed out from the floor at the IPTV Forum, "this is all about you guys trying to defend entrenched positions." I actively boycotted Friday's User-Generated Content forum, because it was so stupid. Check out the programme: a day on user content dominated by executives from Mediacorp, the monolithic company that owns, among other things, every single radio station in Singapore. The day was sponsored by Singapore's Media Development Authority, which is part of the same official system that makes Singapore's media the lamest in the region and bans satellite dishes. It would be a joke, if it were funny. Conspicuously not invited: the Singapore's blogfather and creator of one of the best podcasts anywhere: Mr Brown. Look out for him in New Zealand in August, at the Bananas NZ Going Global conference and possibly elsewhere, and for coverage in Public Address Radio and The Listener. Top guy. The WTF! Show goes to CommunicAsia! Bluff people one, where got mobile stuff? There was not a single mobile phone cover in sight! See for yourself! Find out how we can get even better at tax collection! Behold, The S! Pedal your way to safe riding at mrbrownshow.com. the mrbrown show: got milk? We need new sources of milk! Go and sign up at mrbrownshow.com! Mr Durian tries to get away from it all at mrbrownshow.com. Why is the Terminal 2 viewing gallery so lousy? Part 1 to 4 of the funniest soap opera parody I've seen so far, by the crazy guys at MADtv, starring Bobby Lee, Sung Kang, and Cathy Shim. 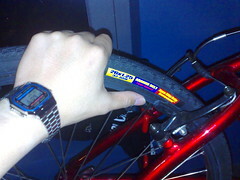 After riding on the road to and from work for a bit, I decided to change the tires on my Kona MTB, since I use it mainly on roads. I replaced the knobbies on my Kona MTB to Panaracer Tserv 25x1.25 26x1.25 slicks. The auntie asked me, "Do you want the red or black colour ones?" And then she answered for me, "Black lah, whole bike red not so fierce." So I sat there at the shop, near midnight, waiting for the uncle to change my tires. The bike did feel a tad lighter after the change and handling improved too. As he changed my tires, the uncle chuckled at my lights. "So many ah," he said. Ya, I replied, saying that I ride home late at night a lot, and I am very kiasu one. Want to make sure cars and lorries can see me. Even my helmet has two small LEDs blinking on it, a white one in front and a red one behind. 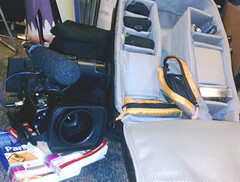 and some of the lights were just for backup, I said, in case the big main ones failed. I am thinking of adding 3M reflector strips to my rims and my bag too. The Panaracer tires got an instant test today. I cycled into a downpour that started as a drizzle, and they did not let me down. The uncle warned me to be careful riding these tires over the red tiled roads at bus stops in the rain, because those get very slippery when wet, and the oil from the buses makes it worse. By the time I got to the office, I was drenched. Good thing I brought a water-resistant windbreaker so the backpack was kept dry. My sneakers, socks and berms were totally drenched though. Must remember to pack some ziploc bags for the handphone and the wallet next time. Also, with my impeccable time, I dripped into the office while there was a TV crew there filming my friends whom I share the office with. Yes, I got another Casio this time. That's a Casio A168W Illuminator. It comes with a blue (not yellow, ok?) backlight but the look is totally retro. Reliable and cheap. I am so geek. William wonders why he is not given the job. Find out why at mrbrownshow.com! Two audition tapes were found showing the robots that tried out for the Transformers movie. Go to the casting couch at See What Show to view them. 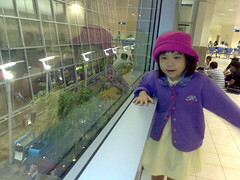 Six-year-old Conny Connie brought tears to my eyes (Youtube text link). And The Kit Kat Girls too, but in a different way (Youtube text link). And the sweet sweet voice of 14-year-old Dominic was brilliant. I loved the politeness and humility with which he conducted himself too (Youtube text link).